One of the things I love about Christmastime is the opportunity to thank and appreciate others around you. It’s fun to plan gifts for our neighbors, my boys teachers, co-workers, friends and acquaintances that may not be on my full Christmas shopping list but that I am still thinking about at this time of the year. 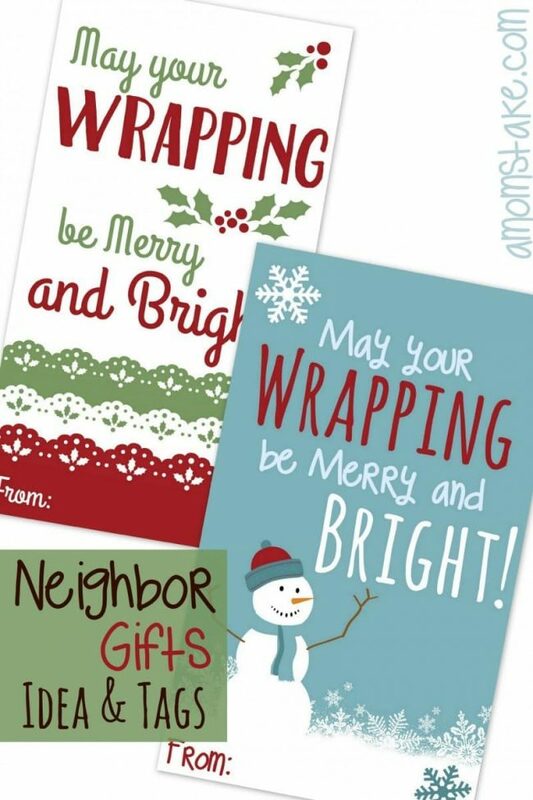 This year, we’re delivering colorful wrapping paper neighbor gifts to celebrate the season and skip the baked goods! 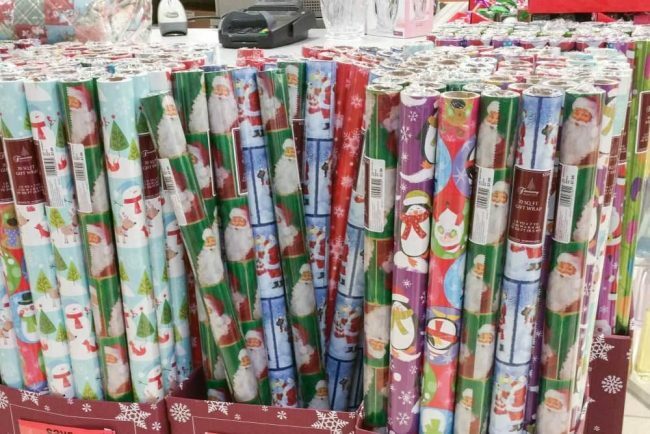 This year, we shopped for our wrapping paper at Sears. They had these beautiful foil wrapping paper rolls with prints I loved! They are modern but still feel holiday and with fresh colors that will give variety to wrapping presents this year. Once home, I made these adorable Wrapping Paper holiday gift tags! You can download a free copy to make your gifting even easier this year! Once I had all my rolls of wrapping paper and other supplies gathered, it was as easy as lacing ribbon through the tape dispenser and tag and tying to secure. Add one spot of tape around the back side to secure the ribbon in place. Then, curl the ribbon with the edge of a pair of scissors and you’re done! While at my local Sears store, I picked up a special gift for someone who is always, always reaching out to help anyone he can. He is the first to show up to fix a broken faucet or help an elderly neighbor with a TV that isn’t working. 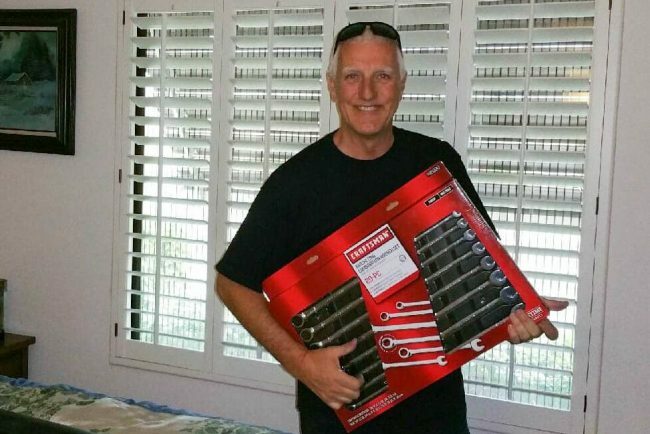 For such a handyman, I spied this Craftsman 20-piece ratcheting wrench set and knew it would be a perfect gift for him. Sears has a newly updated app that lets you add coupon offers, earn rewards, and even shop right in stores! You can use the Sears app to order, then pick-up your order from your car without even unbuckling! I was thrilled to see a bonus $4 in rewards show up on my app while in my local Sears store and a banner that offered me free shipping on any order I placed online while I was in stores! With Sears, you can always skip the shipping fees on your online purchases. Just have your order delivered to your closest store and you won’t pay any shipping charge. 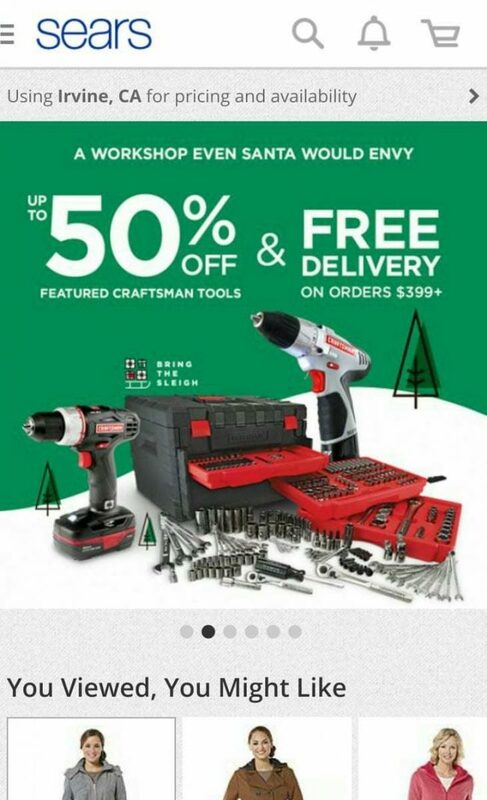 The Sears app even let me load up a coupon to save on my tool purchase while I was in the checkout line! How cool is that!! Seriously, I was saving money I definitely would have spent anyways as I didn’t walk into the store with any coupons in hand. 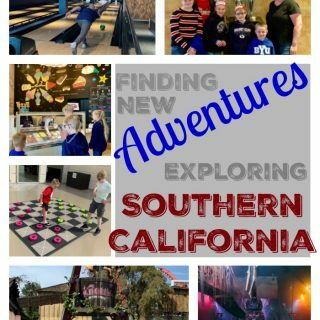 Check out the app at Sears.com/mobile! If you ever shop at Sears, it’s a must have app. I have never seen this idea before! What a sweet idea and very helpful too! ordering on line and picking up the in the store is great. i have always loved sears they have some of the best things. What a cute idea! Speaking of wrapping paper, I need to wrap some gifts STAT!! That is a super cute idea for neighbors. I will remember that next year! This sounds like a great app. I like that you can find coupons that you can use while you shop. 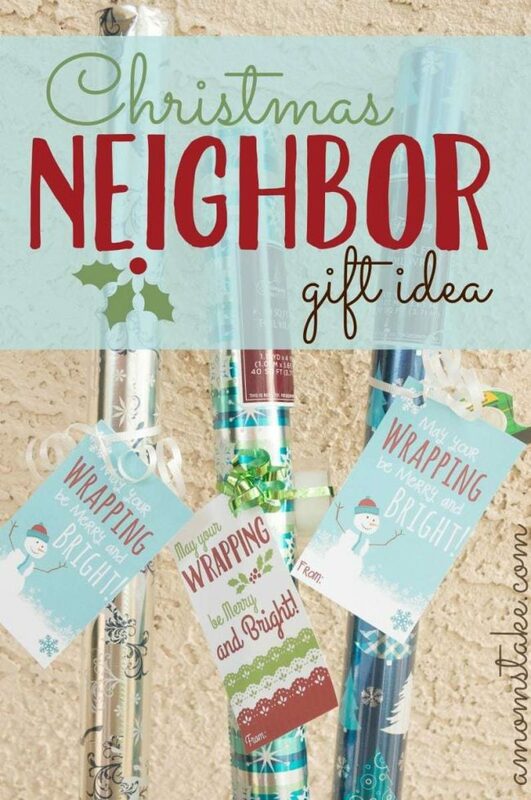 This is such a nice way to give neighbors a nice little present that they’ll definitely be using in the holiday season! Sears is a wonderful place to shop for everyone’s gifts and grab your gift paper as well. Your neighbor sure looks happy. This is a genius idea! 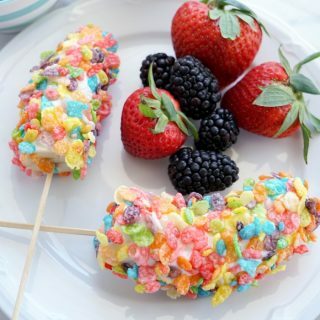 We often gift homemade treats to the neighbors, but, really, it’s nice to not give food when people are being so bombarded, right? I love Sears!! Their app is amazing to help save money, and love this gift idea! I had a student give me wrapping paper when I was teaching and it was the BEST! I had forgotten about that, thanks for the reminder! Wrapping paper is a great gift idea. I am always running out of paper. I will have to make some gift tags. This is a great idea. I love the gift tags. I need to print some tags for this weekend. I will be wrapping all the kids gifts. Love these cute gift tags. I never thought about gifting something as simple as wrapping paper. Giving wrapping paper as a gift is such a great idea. There are so many pretty patterns and people never have enough paper! I’m loving the cute gift tags! I’m going to have to check out the changes to Sears’ app. I might find some nice deals! Coupons, Consumer Review and brand reps..what’s not to love?! The gift tags are cute. The app looks fun and useful! What a cute idea for. Neighbor gift. Who doesn’t need some extra wrapping paper around the holidays? I love that you can load coupons on you phone and go! I am a big frugal saver so this would be a perfect for me! 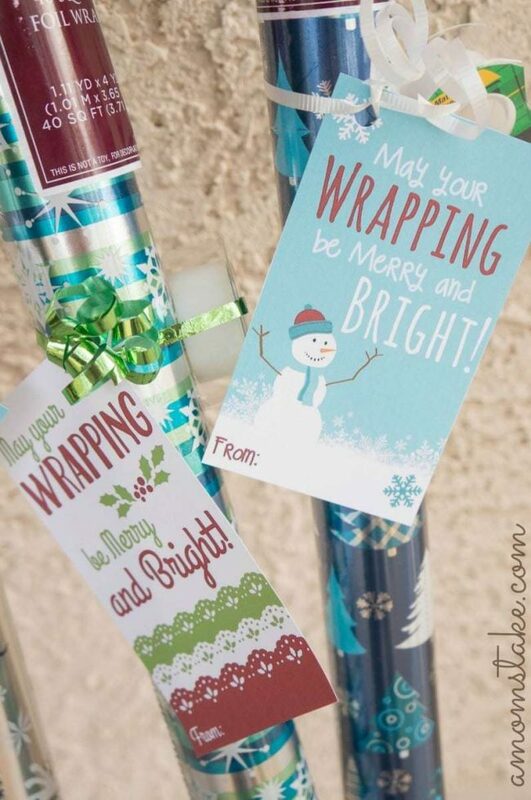 What a fun idea… I know I would love to get a roll of wrapping paper, especially when I realize I am a roll or two short. And those printables are super-cute. Thanks for sharing. 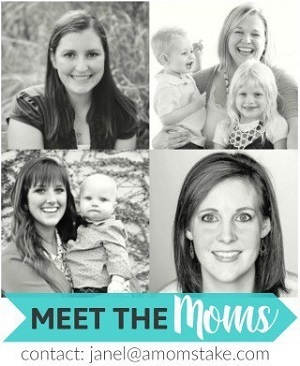 What a cute printable! 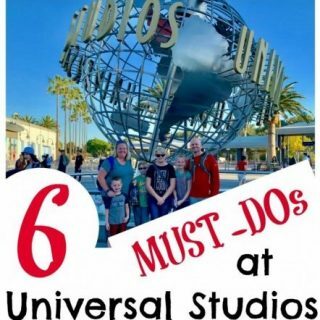 We just moved in August, but I think it would be a great idea to send something next door! I just picked up a little something for my next door neighbor, so I will definitely use your printable. So cute. I like that you can order online for store pick up–in your vehicle, without getting out of your car! I like that it can make Layaway payments. I like the feature of being able to compare prices the best. I liked the coupon features the best. 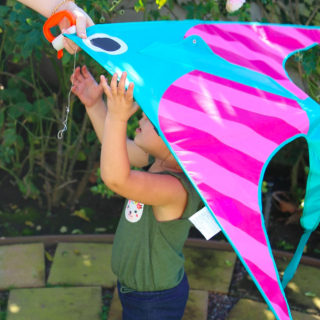 Thank You for the giveaway… we like the coupons & the ability to compare prices of items ! The e coupon feature is sweet !! I love the instant coupon feature. I like that I can pull up the local Sears ad. The coupons are what I like! I really like that you can compare products by feature, price and user reviews. I like being able to get coupons. Saving ecoupons sounds like a nice feature. I love the fact that you can check coupons – premium importance! For me it is the coupons! I definitely like being able to get coupons. I really like the coupons listed on the sears app! I like that you can check sales and promotions and save eCoupons to your profile. I like that you can chat directly with representatives at brands like LG, Monster and Sharp! I like the local ad circular and the coupons. My fav feature is the tracking. I like that you can schedule shipping and delivery with it! I like the ability to get coupons. I love that you can use e-coupons and get sales to your phone! I like that I can get coupons, see delivery and chat with an associate. I like that you can stay in the know about sales and specials, also love the ecoupon feature. I like that you can copare price and get the best deal. My favorite feature is the tracking. I use the actual website everyday to play the instant win games so I already keep tabs on the promos, but to have quick access to tracking while I am out is great. I ability to get coupons. I like the consumer reports info.! I like being able to read Consumer Reports on your favorite products. Btw, love the wrapping gift idea for neighbors. I love this feature: • Stay in the know about sales and promotions and save eCoupons to your profile. I like the instant coupon feature. Visited and my favorite is After your order is placed, it’s easy to check your order status and track shipping, delivery or returns information. i love how you can save your coupons to the app. so convenient. I like the coupon feature of the app. Savings are always good. I really like the instant coupons part of it. I like that you can compare reviews with the app. I really like the feature that allows you to chat directly with the brand representatives. I like that you can use coupons on it. I love the coupons on the app! I like that you can add coupon offers with the app. I like that you can compare reviews and see the Consumer Reports on products. Nice to have it all in one place. I like that you can chat directly with brand representatives. I like that you can find what’s on sale in a store near you today with our LocalAd circular, buy it and get it with FREE Store Pickup. I like that the app gives you the ability to track seamlessly after your order is placed. The app makes it easy to check your order status and track shipping, delivery or returns information. Very informative and convenient. I love the in app coupons. I’m always shopping with coupons. I like that you can earn rewards. I don’t use a smart phone, there for I don’t have a need for apps. However I am a SEARS shopper & would appreciate this prize. I love the Sweeps tab/feature. Who doesn’t love the chance? I like that you can comparison shop and get coupons. I always search for the lowest price before buying anything big. Thank you! I like that it has access to consumer reports within the app. I like the instant coupons. I like that you can compare products by feature, price and user reviews. I like the coupon feature. I like the coupon feature. I hate having to remember brining them along. Your link doesn’t work but I like the instant coupons. I don’t use apps however if I did I would like the instant coupons. I really like the in-app coupons – super smart. I really like the price comparisons. Who wouldn’t want to get the best deal? Your link denied my access. I like the idea of using coupons and saving money during my holiday shopping. Check out the Sears App Info page at Sears.com/mobile and tell me which of the app features you love best! Me, I like Price comparisons. I do not have much money and I don’t like over-paying for anything. I always bargain shop. Second hand shop a lot too. Oh I love that you can stay in the know about sales and promotions and save eCoupons to your profile! I love that you can chat directly with people that represent that brand. I love that they have the consumer reports there! So helpful! I love how you can compare prices. • Stay in the know about sales and promotions and save eCoupons to your profile. hat I can apply coupons! My favorite feature is that you can make Layaway payments using the app. Thanks for the giveaway! Love that I can apply coupons! I like being able to compare products by price and user reviews. My favorite features are the coupons and the price comparisons! Time-saving! Love that you can get coupons and browse. I like that you can check out the consumer reports. I love the in-app coupons!! I like that you can shop using the circular and pick it up in the store for free. I like that you can make layaway payments on the app! I like that there are exclusive member coupons. I like the user reviews and also the compare pricing. The consumer reports are helpful. I love that I can instantly get a coupon! I like that you can See what Consumer Reports has to say about the products you shop. I like the scheduling of shipping, delivery, layaway features. I love that you can instantly get a coupon! I like the price comparison and e-coupons features. That you can chat directly with certain brand reps! I love that you can read Consumer Reports on the products you shop for.